GRAND RAPIDS July 1, 2016– Any residents needing food assistance this month can stop by First Community AME, 500 James St SE in Grand Rapids on Thursday, July 21, to pick up several pounds of fresh produce and baked goods. The food truck, sponsored by west Michigan union members, will open to the public at 4pm. Anyone interested in volunteering to help distribute the food should arrive at City Life between 3pm and 3:30pm for set-up. 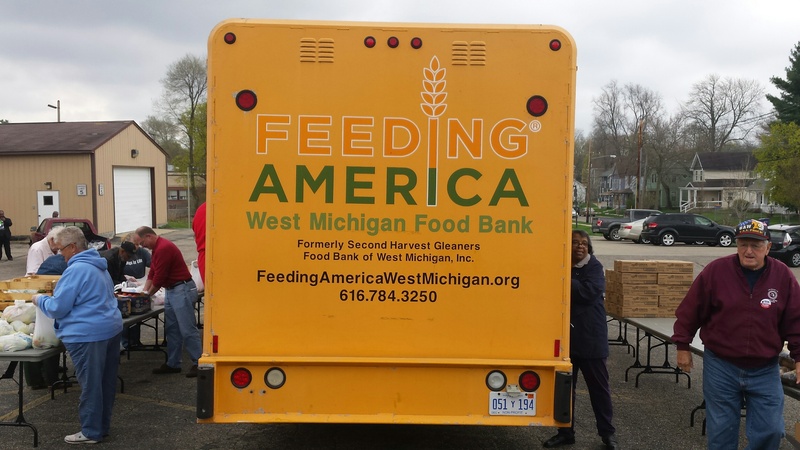 The trucks– provided by local unions, individual donors, Feeding America West Michigan and Heart of West Michigan United Way– hold 5,000 pounds of produce, baked goods and other food items. For a complete 2016 schedule of the food trucks, click here. Anyone who is in-need is welcome to come and receive food, no questions asked and no proof of income is required. The monthly food truck program is funded through the generous donations of working men and women. If you would like to help fund a food truck, you can make a tax-deductible donation to the Labor Heritage Society of West Michigan. For more information, please contact the Kent-Ionia Labor Council. This entry was posted on July 1, 2016 by WMALC in Community service news and tagged church, Feeding America, First Community AME, United Way.